The church: All Saints, Carshalton, Surrey, England. The building: The presence of a church in Carshalton is recorded in the Domesday Book, but it is not known how long it has been there. The tower is the oldest part of the present building – pre-Norman Conquest – and the bells in the tower were restored and became ringable again, after many years out of action, some 25 years ago. It appears that the nave was originally built about 1150, with three bays of the south aisle added about 1200. All evidence points to the fact that as renovations and additions were made through the centuries, workmen showed little if any respect for the efforts of their predecessors, filling in windows, altering doorways, replacing stone with brick, and in some cases even stealing the brass fittings. By 1884 the patchwork infrastructure of the building had become quite unsafe, and Lord Victor Seymour, the rector, made the bold decision to build a new church as well as to set the church squarely on the tractarian tradition, which has continued to this day. Father Corbould, the rector from 1919 to 1958, was a friend of the flamboyant church furnisher Sir Ninian Comper, who was responsible for the magnificent ornamentation and embellishments visible today. 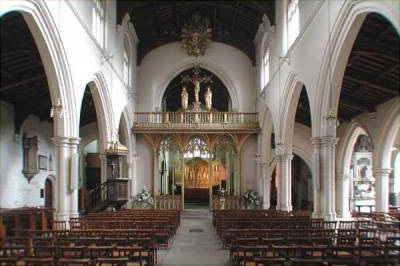 The church: All Saints offers conservative but not male-dominated worship in the Anglo-Catholic tradition of the Church of England. The church has a history of long incumbencies; the present rector is only the sixth since 1845. The aforementioned Father Corbould arrived in 1919 and remained in post until 1958; an avowed anglo-papist, Corbould used an English translation of the Roman Mass. The neighbourhood: Carshalton is now part of the London borough of Sutton, and is situated between Sutton and Croydon in the diocese of Southwark. The church sits at the end of a busy shopping area; other roads nearby are residential. Right opposite the church is a large duck pond, giving a rural impression in what is otherwise an all urban setting. The cast: The Rev. Hugh Naunton, celebrant and preacher, vested in a Roman chasuble of reddish purple with matching stole. Assisting were two lay subdeacons, one male and the other female, vested in matching tunicles, and a team of six servers, boys and girls aged from about 5 to about 20, vested in albs, plain amices and girdles, except for one who was robed in a black cassock with a wide sleeved surplice. The date & time: Sunday, 5 March 2006, 10.30am, the first Sunday in Lent. High Mass with Great Litany in procession. About a third full, with about 45 in the congregation scattered all over the nave. Yes, both Father Naunton and the tower captain greeted me. Wooden chairs – yes, they passed muster. Being a bell-ringer, I could not resist visiting the tower upon arrival. The tower captain, a woman named Rosemary, knows me from the local ringing association and introduced me to the other ringers present. Rosemary was quick to recognise that my presence made up an exact full complement of eight ringers, so that all eight bells could be rung. Forgive me for talking shop for a moment to those who understand these things, but we rang call-changes incorporating Tittums and Whittingtons, and then I went down into the church as soon as ringing had finished. After a moment or two of golden silence, the sacristy bell rang and the Great Litany was begun. "O God the Father of Heaven: have mercy upon us miserable sinners." The Great Litany was sung in procession to the Thomas Tallis setting. None. There was a specially printed leaflet for the whole order of service, including the prayers, the hymns and the readings. There was a Book of Common Prayer in the pew, but it was not needed. Many things. The junior subdeacon was a lovely, angelic looking young lady in her teens or early 20s, with beautiful golden locks of hair reaching the shoulders of her tunicle. The boat-boy was taller than the thurifer, which was slightly incongruous. Up above the chancel screen was a Calvary, and higher still was an image of Christ in majesty, which drew my eyes upwards more than once. Some of the details of the ceremonial were old-fashioned, such as the celebrant being censed at the introit instead of at the offertory; the sacred ministers genuflecting at the incarnatus during the creed; only the elements and not the altar being censed at the offertory. It was a traditional high mass, eastward facing at the high altar. The rite was Common Worship Order One in traditional language. The Tallis setting of the Great Litany got things off to a sombre start. Parts of the service were done a cappella, and the creed and other parts were sung to Merbeck. Fr Hugh sang the service beautifully. A cantor was in evidence out of sight, possibly in the organ loft. An air of peaceful reverence pervaded the service all the way through. 8  Father Hugh spoke clearly, and everything he said was relevant and to the point – no more, no less. Father Hugh preached on the Gospel reading for the day (Mark 1:9-15, Jesus's baptism and temptation in the desert). The rite of baptism includes repentance for one's past sins and a resolve to follow Jesus in the future. Church architecture and furnishings include many symbols relating to baptism. He gave a reminder of the Holy Spirit in baptism; what the church is for; and benefits of spirituality. Lent allows us to be led by the Holy Spirit, enabling us to listen to what God is saying to us. The moment of the consecration prayer at the high altar, with the clouds of incense and sanctuary bells in that peaceful and reverential setting. During the intercessions, the microphone kept going on and off, making it difficult to hear. Also, the heating may have been inadequate, as many people kept their coats on. As the earlier bell-ringing had warmed me up, and I don't feel the cold, this is something which may have been felt by other people, but not by me. Two or three people said good morning to me with no other conversation. Father Hugh said hello and added that this was the first time he had officiated here on his own. I recognised someone I had seen before, and asked him about coffee. He told me that there were plans to build a kitchen in the church, as well as a user-friendly toilet, but that was yet to be. There wasn't any all morning at any stage. Tut-tut! 6  I was all set to give the church an 8 until people said good morning without stopping to say more, and until I found out there was no coffee! Father Hugh's dignified approach and the fact that I was able to take part in the bell-ringing saved the day for me; otherwise I would have felt left out and unwelcome. I was reminded of the old quip about the curate's egg – good in parts, and the bad parts left a lot to be desired. The peaceful, reverential atmosphere that pervaded the service all the way through.